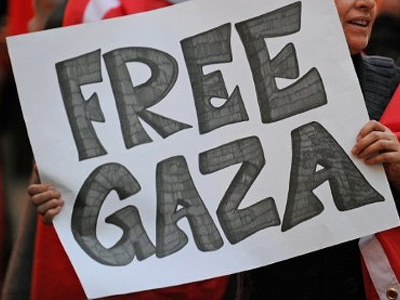 In May, Egypt announced that it was lifting the blockade of Gaza from its side. This has prompted many to wonder why the upcoming Gaza flotilla is necessary. We found some compelling reasons. Dr. Anne de Jong from the Gaza flotilla’s organizing committee says that only Palestinian men younger than 18 and older than 40 are allowed to pass freely through the Rafah checkpoint. All other Palestinians are required to present invitation letters and many other official documents in order to get through. According to Dr. de Jong, cargoes of building materials and medical supplies are still failing to reach Gaza through either the Rafah or the Eres checkpoints. She notes that some of the many consignments of expensive spare parts and replacement medical supplies destined for Gaza’s hospitals which were seized by the Israeli authorities a year ago still have not been handed over. Doctors in Gaza have repeatedly urged the international community to help, saying that these materials are essential. Without them, the equipment in operating theatres and intensive care wards remains incomplete and therefore unusable. Doctors in Gaza say they cannot obtain these materials independently.It is impossible to smuggle them in through the tunnels. 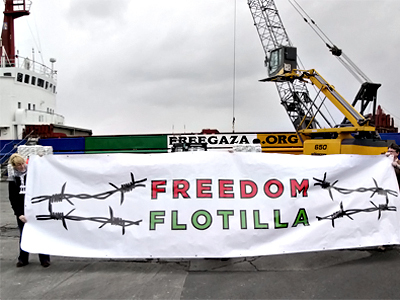 Dr. de Jong says this is why the flotilla is trying to break the sea blockade: Gaza needs these cargoes. Anne de Jong revealed that over the past year, the Israeli authorities had been forced to hand back 70 per cent of the medical supplies they had seized, under strong pressure. “But how did it do that? For example, we carried an entire shipment of electric wheelchairs meant for children and adults who cannot walk or are partly paralyzed. The Israeli side handed over those wheelchairs to Gaza, but only without electric motors, which made these wheelchairs absolutely useless.” Anne de Jong was just a passenger on last year’s flotilla. She said she was arrested and captured afterwards. 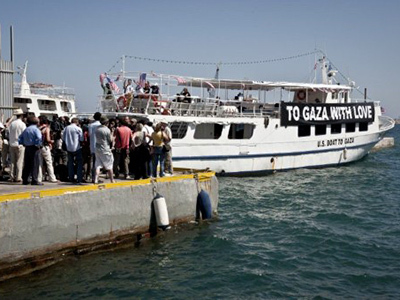 She said that the Israeli prison authorities had used sophisticated methods of torture on the flotilla passengers. She personally was deprived of sleep because the Israelis took her to interrogation sessions every two hours for almost two days. She explained that she is not taking part in this year’s flotilla, not because of her bad experiences last year, but because she is pregnant. Lawyer Julian Baches described the five-year blockade of Gaza as a judicial nonsense. If Gaza is an occupied territory, it is impossible to impose a blockade on it. 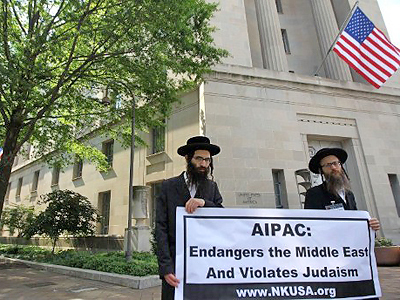 However, according to him, Israel is denying that Gaza is an Israeli-occupied territory. The lawyer says he does not understand on what grounds the Israeli side is subjecting one and a half million people to collective punishment and blockade, and is banning ships from entering Gaza’s port. 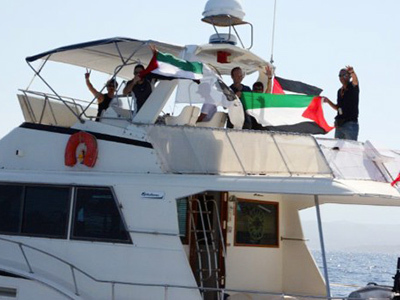 This situation has motivated the creation of a second flotilla which is heading for Gaza to break the blockade. 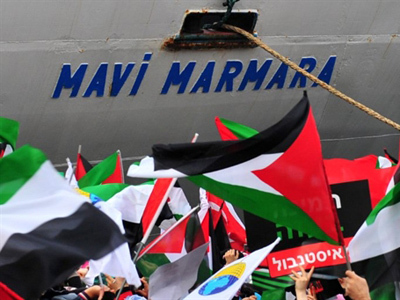 Lawyers for the Free Gaza flotilla have pointed out that under international law, a 12-mile strip close to the coast is considered territorial waters. In their view, Israel has been illegally regarding a 20-mile stretch of coastal water as its own territory. This means that Israel has forbidden fishermen from Gaza from fishing any farther than three miles from the shore. 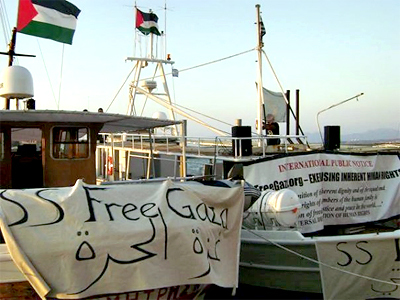 Activists from the Free Gaza flotilla claim that Israel has declared open season on the fishermen. 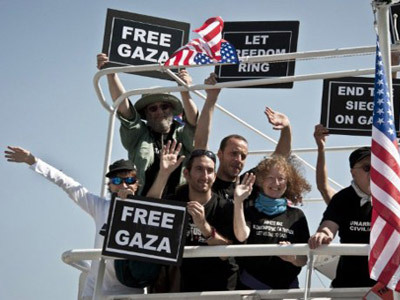 They are arrested or even killed sea as if they were terrorists for simply trying to catch fish in Gaza’s own waters. It is interesting to note that some flotilla activists have stored fishing rods for use in international waters in order to feed those crew members who are not strict vegetarians.